Consulates and Embassies in Central African Rep.
Embassies and Consulates in Central African Rep.
You're in luck, given that we have located, selected and archived every Embassies and Consulates in Central African Rep. that exist in this area. Consulates would be the representation of public administration in the country and supply legal and administrative services. They also facilitate the relationship of citizens to their host country. The territory occupied by the Embassy is own by the represented country. Its mission will be to promote the interests of his country in the host nation, promoting friendly relations between the two countries, promote economic, cultural, scientific, etc, making state visits, both commercial and political treaties, among many other functions. Even in case of conflicts, wars, inviolability of diplomatic premises is respected. The diplomatic legations enjoy a unique status: they are inviolable. The security forces of a country cannot enter a room enjoying diplomatic protection under any circumstances. If you look below you might see the Consulates in Central African Rep. and nearby towns that exist in our database diplomatic missions worldwide. The administrative procedures that can be performed in a consular office vary between countries, so we recommend that you simply contact the Embassies and Consulates in Central African Rep. and around just before going to accomplish any management. Access to this section for a detailed listing of all Chinese consulates, embassies and representative offices situated near Central African Rep..
ConsulBy provides all Indian citizens with an updated and verified list of all Indian consular offices so they can contact them with any unexpected situation whilst in Central African Rep. and its surroundings. Have a look making use of this link a collection of all US embassies and consular offices placed around Central African Rep., just in case you will need assistance while you're abroad. Check the Nigerian diplomatic mission in Central African Rep., responsible for providing assistance and support to any Nigerian person when they are visiting the country. Access to this section to get a detailed listing of all Russian consulates, embassies and representative offices located near Central African Rep..
ConsulBy offers all German citizens with an updated and verified list of all German consular offices so they could contact them with any unexpected circumstance while in Central African Rep. and its surroundings. Have a look utilizing this link a collection of all French embassies and consular offices placed around Central African Rep., just in case you need assistance whilst you're abroad. Check the British diplomatic mission in Central African Rep., responsible for providing assistance and support to any British person whilst they are visiting the country. 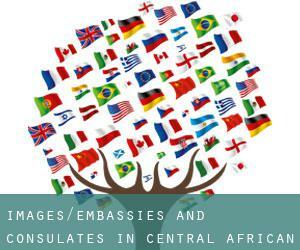 Consular Offices in Central African Rep.
We have classified all embassies by nearest town. Given that Mbaïki is among the six largest cities of Central African Rep., with around 67.132 inhabitants, it really is likely that hosts numerous consulates. The embassies and consulates situated in Central African Rep. and exist to help their compatriots to solve any trouble as if they had been back residence. Follow the link to see all Embassy in Bimbo and its surroundings. It is almost impossible to visit Central African Rep. bypassing Kaga-Bandoro (with 56.520 inhabitants). ConsulBy currently has an extensive catalog of Consulate in Kaga-Bandoro and surroundings. The embassies and consulates situated in Central African Rep. and exist to help their compatriots to solve any problem as if they had been back residence. Stick to the link to see all Embassy in Sibut and its surroundings. Problems with Central African Rep. authorities? Get in touch with immediately with any from the diplomatic missions borwsed for Berbérati to locate the ideal resolution with the local authorities. One with the busiest centers of population Central African Rep. is, without having any doubt Bangui with 542.393 inhabitants, producing it a great candidate to host one or a lot more Consulate in Bangui. One from the busiest centers of population Central African Rep. is, without any doubt Carnot with 38.071 inhabitants, making it a very good candidate to host a single or more Embassy in Carnot. Diplomatic missions are usually in populations with greater number of inhabitants. With 40.201 residents Central African Rep. is one of the most influential centers of population Central African Rep..